This isn’t the first time I have talked about how much fun can come my way being a blogger and this is definitely one of those times. I found out the other day about this awesome event happening this weekend right here in Toronto – Oktoberfest at the Steam Whistle Brewery! Here is the poster taken directly from the Steam Whistle site where they have an event page, but don’t worry I am going to get into more detail below. I met with Greg Taylor, the co-founder of Steam Whistle and was given a tour by his wife Sybil and they are both amazingly nice people. 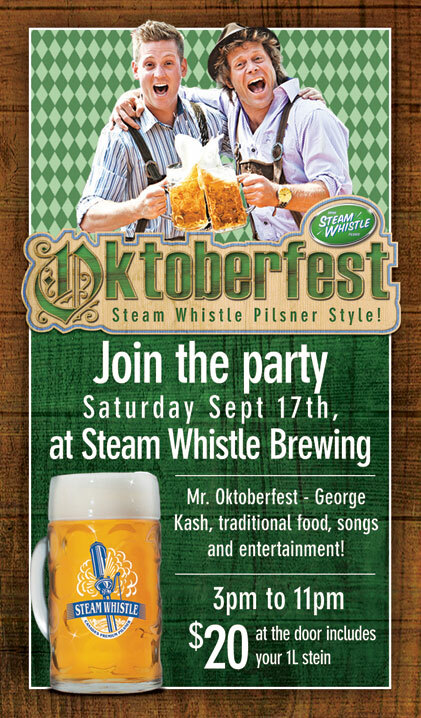 They also love to party and have a warm relationship with their staff treating them almost like a huge family…in fact, the guy on the right with the hat on in the promotional graphic for Steam Whistle Oktoberfest below is Greg Taylor! There is a man who clearly likes his beer! No models or random dudes for Steam Whistle, the founder of the company is in their pics! (Although maybe next year you guys can include a German bar maid or 3 on the poster? No offense Greg.) The other guy in the picture is Josh Hillinger, the Steam Whistle retail manager. The Steam Whistle Brewery is located at 255 Bremner Blvd in Toronto (Google Maps link) which is right near the Rogers Centre (aka SkyDome) and a couple minutes walk from Union Station. (The walk is all indoors, even though it is supposed to 18 degrees Celsius and sunny on Saturday according to the Weather Network http://www.theweathernetwork.com/weather/CAON0696). Steam Whistle will also, I am told, going to have SHUTTLE SERVICE from Union Station right to the brewery in the Steam Whistle Party Bus. The event starts at 3pm and finishes at 11pm so you will have ample time to catch the subway – or even go out to your next location as the city’s Saturday night really warms up. Entry to the event will cost $20 at the door which includes a 1L Steam Whistle beer stein. I already managed to snag one when I went for my tour the other day of the Steam Whistle Brewery and I took a picture of it with a standard sized hanger behind it so you can understand how huge this thing is. Remember, it is a cash only situation at the door and inside. There will be an ATM available to take out money if you need it but, no credit cards can be used to buy tickets. Steam Whistle 1 Litre Beer Stein with standard clothes hanger in the background for sizing. 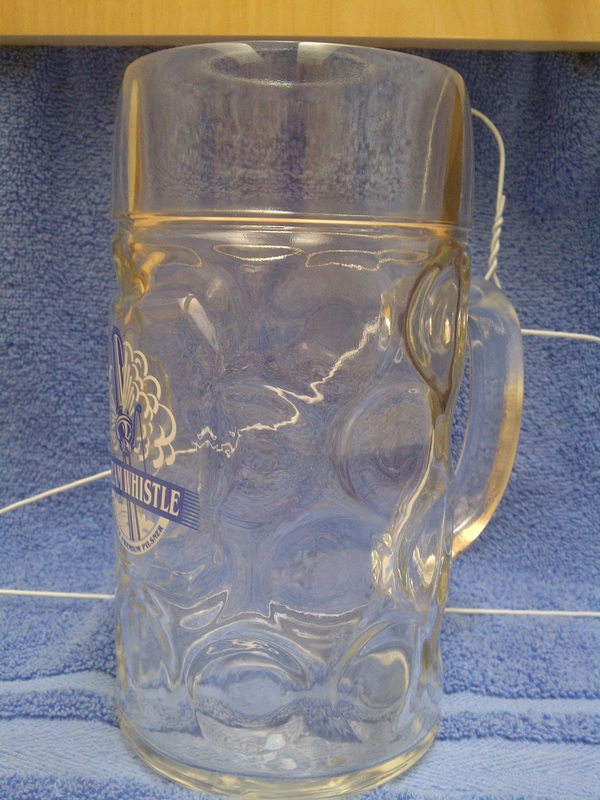 While you are at the event it will cost you $5 per half a liter/mixed drink & $10 to fill the liter stein. One liter of beer for $10? Sounds like a pretty good deal to me! You can also find out details on their Facebook Page as well as use their Facebook Event for this shindig if you want to spread the word and tell all your friends to come out and get in on the fun. The hastag for the event will be #SWoktoberfest and the Steam Whistle Twitter account can be found at @SteamWhistle so even if you can’t make it at least you can follow along with our antics online while you drink some Steam Whistle at your desk. Steam Whistle employees each are allowed to take home one 12 pack of beer per week. 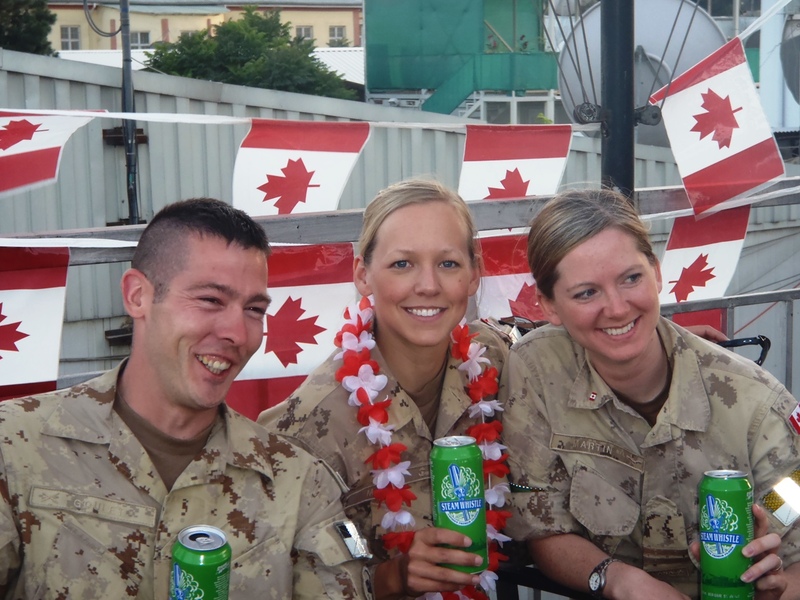 During the Canadian Forces mission to Afghanistan the staff were allowed to donate their beer to our troops and whatever they sent, Greg & Cam - the co-founders - matched. This has gone on every year from 2006, twice a year in June & November for Canada Day & Christmas. Picture courtesy of Steam Whistle. Like I said, doors for this event are going to be at 3, at 3:30pm – 4:00pm will be when Steam Whistle’s Brewmaster, Marek Mikunda taps the first keg and makes a toast with his mazek, the antique copper drinking vessel given to him as a parting gift from his colleagues in Europe. The mazek itself is something that is passed down from brewmaster to brewmaster so the fact that Marek’s European colleagues were willing to give it to him is huge in terms of sentimental value. A German Polka Band will be on hand, there’ll be traditional Oktoberfest food, and entertainment by “Mr. Oktoberfest” George Kash and “the Oktoberfest Express” will entertain. Liter steins of Steam Whistle Pilsner, gigantic doughy pretzels, lip-smacking pork hocks, folk dancers, and arm-linked crowds joined in revelry and refreshment will all be on offer at Steam Whistle Brewing on Saturday. It sounds pretty freaking epic and I cannot wait to go. So grab your lederhosen and your dirndles boys and girls (OK, men and women…this is a 19+ event, of course) and come out on Saturday! Don’t have? Not to worry! 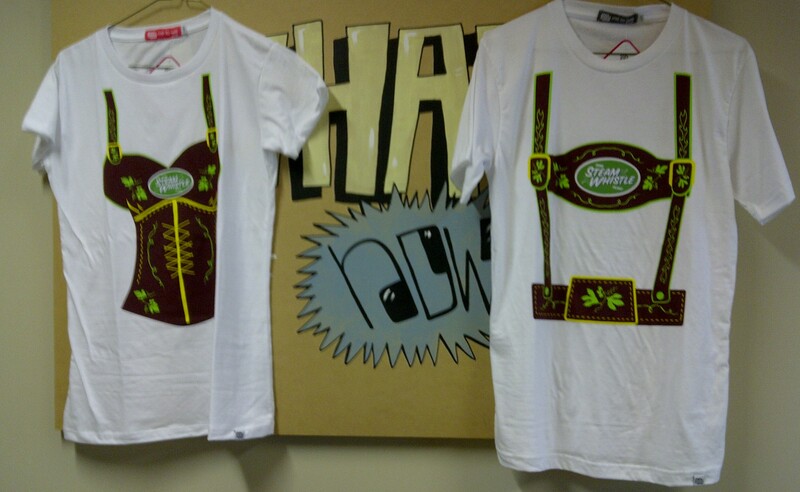 The Steam Whistle crew will be selling the tshirts in the above picture to help get in the mood. $20 each and available in a variety of sizes. The crew at Steam Whistle hooked me up with a free tour of their brewery, a free ticket to Saturday for me and a friend, a free 12 pack of beer, and a free beer stein (which I mentioned and pictured above). I personally would still have gone anyway because it sounds like one hell of a time and Munich is pretty damn far to go to on a whim unlike coming to downtown Toronto on a random Saturday. Beyond that, my new hat gives me warm and fuzzy feelings towards the Steam Whistle crew. “What new hat?” you ask. Well, if you take a look at the picture below you’ll see it. The picture is of a Tim Hortons Kandahar cap. Greg, co-founder of Steam Whistle, gave it to me when I admired it upon my meeting him. I walked into the room to meet him and he was wearing it and I commented on how lucky he was to get one as I have wanted one since 2006 (I said 2004 but I misspoke). He said he never wore hats because they don’t fit him correctly, took it off, handed it to me, and refused to take it back. I have wanted one of these for a long, long time. I remember the first time I saw these hats when they announced Tim Hortons were going to be opening a location in Afghanistan for Canadian troops to get a taste of home. People working at the Kandahar base location were given these hats with the Canadian CANPAT camouflage design and I instantly wanted one. Much to my chagrin at the time, I was unable to find one even though I scoured the interwebs looking. Now, all of a sudden, thanks to the awesome folks at Steam Whistle I have one of my own. So ya, I have a very special place in my heart for Steam Whistle and the team aka ‘family’ which makes it. Oktoberfest at Steam Whistle was a fabulous event! Glad you have such positive things to say about Greg and Sybs (they’re my cousins!) and the brewery 🙂 I’m a huge Steam Whistle fan (by choice, no pressure) and flock to the events hosted at the brewery as they are always such a blast! Dear RIM: Marketing Idea For All Y’All – Market To Celebrity Security I TIFFed Today!